I plan on using household items in my project and will not be doing my experiment in a lab. Safety is my first concern. I have no one in my family who can help me with acid and base. My grandmother gets heartburn all the time. I thought I would do an experiment to test 3 antacids to see if one worked faster than the other. For my science fair project on heartburn relief, I plan to - test 3 antacids using the red cabbage juice as an indecator adding vinegar to make the solution represent stomach acid. I plan to test Mylanta, Rolaids, and Tums to see which of these three antacids will neutralize the acid the fastest. I want to use a stop watch and graph the results. I'm in need of advice. Please answer a few questions. Do you think this is a good experiment to do? What else do I need for this experiment? Should I test more than three? What should I put in the report? I want to do this project next weekend and need advice soon. If you could make suggestions or give advice in anyway, I would be grateful. That sounds like a fantastic project! Make sure you wear safety glasses because it would really hurt to get vinegar in your eye. I think three antacids is a good number to test. I can think of two ways to graph the results. The easiest is to simply time how long it takes for each antacid to neutralize the vinegar solution and then make a bar graph showing the time for each one. If it doesn't change color, it means you used too much vinegar/not enough antacid. Even if you want to do the more complicated experiment, I would do this one first to make sure everything is working properly. 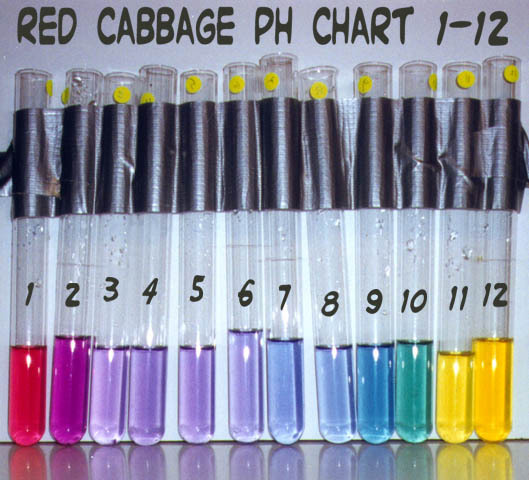 These website have pictures of what red cabbage juice looks like at different pH levels so they might help in determining this. Then you can graph pH versus time for each antacid. Household vinegar should start around a pH of 2.5 to 3.5 and hopefully if you use enough antacid, it will be neutralized to a pH of about 7. The introduction should explain essentially what you explained in youre-mail. You should explain what antacids are, what they do, and why you want to test them. In the hypothesis section, you should include your question: Which antacid neutralizes acid fastest? and a hypothesis like "I think Tums will work the fastest" or "I think it will take 10 minutes for the antacids to neutralize acid." You could also explain why you are making that hypothesis. In the Materials and Methods section you should include a list of all of the materials you used, and also a list of the steps you performed for the experiment. Explain how you extracted the cabbage juice.Explain how you made the vinegar solutions. How much vinegar did you use? How much antacid did you use? etc. In the Data and Results section, you should have your graph of your results and also any observations about the experiment. In the conclusion, discuss what the results were and how they relate to your hypothesis. What did you learn from doing the experiment? Was there anything unexpected? If you have more questions, feel free to e-mail me again. I am happy to help as much as I can.